After you not getting approved by Google Adsense, today I am telling you good Google Adsense alternatives. Adsense is one of the most "Good" income sources for many bloggers out there. And webmasters earn Billion of dollars just using Google Adsense only. Google has paid over a "Billion Dollar, is" last year for its publishers. After getting banned to Adsense, many of webmasters looking Google Adsense alternatives. Good and highest paying Google Adsense alternatives that you can apply for and monetize on your website & blog. Media.net is the most popular and well contextual ad platform just like Google Adsense, powered by (Yahoo & Bing). Many webmasters making decent amounts using Media.net. If your blog has quality and unique content, So you receive high paying and relevant ads being displayed. Buysellads are best Adsense alternative but some, difficult to get approved. Your blog is displayed on their marketplace Buysellads are based by fixed price banner advertisement platform where you create ad zones on your blog or website. And 25% of the amount you earn on each ad spot that you sale. And cashout via wire transfer. Infolinks is a text based ad platform where their system chooses the appropriate keywords on your blog and blog posts which are then turned into ads. Different forms of ads now like static ads that take over your unused space in the margins of the blog, and both on the left side and right. Infolinks in the cost per click is very low. Still, as these ads are text based. Adversal is a (Cost Per Click) ad platform just like Google Adsense. Requirements the publishers have at least above (50,000) page views per month to get approved. Payment options like wire transfer, PayPal, check, and minimum payout are 20$. Also pay 20% commissions to the affiliate advotisment. Over 400,000 publishers use Chitika, It's a CPC (Cost Per Click) platform similar to Google Adsense which lets publishers customize ads. VigLink is much like a affiliate link "Cloaker" which scans your blog's keywords and automatically ads affiliate sales links to them. As many link cloakers are only available for WordPress platform and many webmasters on Blogger are left out too. Skimlinks is a similar to Viglinks and it converts your blog post keywords into affiliate links just like Viglinks does. So you can try out any of these two platforms. Skimlinks works with mobile apps and you could convert your mobile app's text into affiliate links, and earn on every sale. Skimlink is that they have partnered more than 21,000 affiliate programs. Great post!! Thanks for sharing this wonderful information. I think it's awesome someone is finally taking notice of our vet's and doing something to help them. I hope all goes well with this articles.More new information i will get after refer that post. this blog is really good and informative and i got more information from your blog thanks for sharing your information. Google adsense approval is easy nowadays also, but many bloggers say it is hard. Why? Because they have not done what you have said in this posts. Language must be English only : I think this is wrong bro. Google AdSense supports publishers in several different languages. I am looking for a secondary Ad network which I can use with Google Adsense for some extra Income from my Micro Niche sites. All my sites are Adsense based micro sites, but I have a big confusion, as i have been reading few reviews of different ad networks around the web and base don all the reviews, I am confused between, Infolinks, Revenuehits, Bidvertiser & Chitika. So, according to you, which one should I use to get the maximum from my micro niche sites traffic? My traffic is a mix from all the countries, also do let me know, which advertiser works best for which country? If you are looking for a solid contextual advertising company, I recommend that you take a look at ExoClick. Discover how THOUSAND of individuals like YOU are making a LIVING online and are living their dreams right NOW. 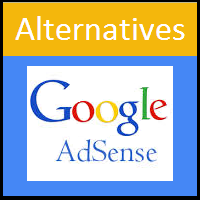 Good google adsense alternatives. It was Really helpful to me. Worth a share. Did you know you can get them ON AUTOPILOT AND TOTALLY FREE by registering on You Like Hits?